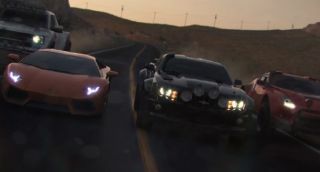 The Crew, shown today at Ubisoft's E3 press conference, is looking to steer racing toward a hybrid between single-player, cooperative, and competitive play in an online persistent world. Or, in other words, an open world MMO-type racing game, developed by Ubisoft Reflections and Ivory Tower. While a car is being constructed by some phantom force to the tune of Glitch Mob, the trailer follows three vehicles on urban streets, rural countryside pavement, and out in the boonies on no pavement at all. The footage ends with a zoom out of California and then eventually the United States, showing players in all corners interacting with each other and indicating that the "online persistent world" is going to be quite large. Gameplay footage shown shortly after the trailer places players in different areas ranging from Brooklyn, New York City to the Black Hills in South Dakota. Through the use of a menu, a player in Miami invites his friends to help him run through some fence posts and take out an objective vehicle. The Crew is due out early next year. For the latest from E3, check out our complete coverage .